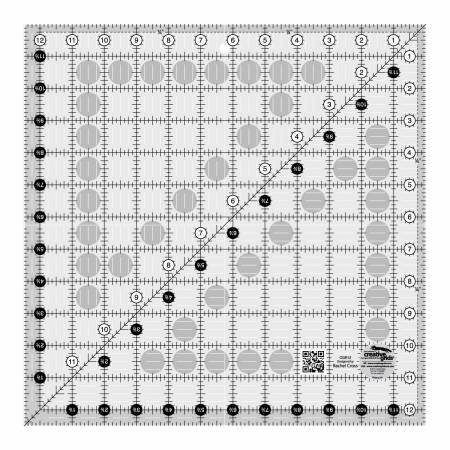 This 12-1/2" square features easy-to-read black and white markings printed in 1" grids marked in 1/8" and 1/4" increments. Use the easy-to-read black numbers (printed on white dots) and the 1/4" grip sides to cut whole inches. The 1/4" dashed lines are printed on two adjoining sides that aid in trimming seam allowances. Use the patented Turn-A-Round feature – designated by the easy -to-read numerical white numbers (printed on black dots) and the 1/2" grip sides to add the 1/2" seam allowance. A 45-degree angle is printed in black and is used to trim half-square triangles to size. White horizontal and vertical lines are printed on the square so the center of the ruler is easily distinguishable. 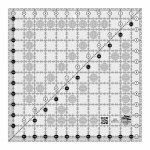 Use these lines to square up blocks whether piecing four-patches or embroidered and appliqued blocks.